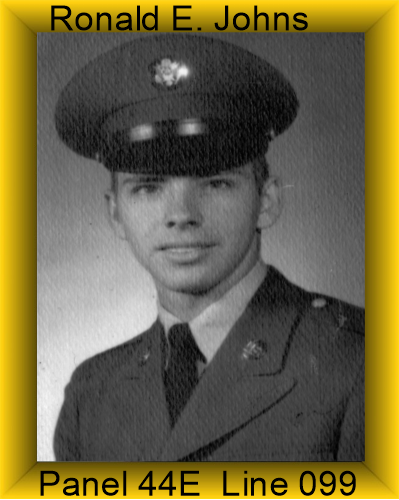 Ronald was assigned to Charlie Troop on August 8, 1967 and was Killed in Action on March 15, 1968. Ronald was an observer on an OH-6A Observation helicopter. Ronald was awarded the Purple Heart, Air Medal, National Defense Service Medal, Vietnam Campaign Medal, Vietnam Service Medal and a set of Crew Member Wings. Mr & Mrs Elmer Johns had four children, JoAnn Clark born in 1938, Betty Wingard born in 1940, Deanna Davis (deceased)born in 1942 and they finally and a son Ronald Elmer Johns born in 1946 in Daytona Beach, FL. Our Daddy Elmer Johns was in 7th heaven to finally have a son, It was such a blessing. Make no mistake, he loved he girls just as much, but Ronnie was special. Surrounded by his 3 sisters he didn’t want for anything. We loved him as if he was pure gold! Anything Ronnie wanted, Ronnie got. Growing up he was sensitive and loving in spirit. Ronnie loved go-carts and his Daddy helped him build one and he won the race! Ronnie graduated from Mainland High School. He was killed in Vietnam on March 15, 1968. My Daddy idolized Ronnie, where Daddy went Ronnie went too. My Daddy grieved his death so much he died in July of the same year at age 50. Our whole family was shocked and we were in morning for what seemed like forever.